MarketWatch is now reporting the same thing we noticed and reported here a short while back - namely, that the Tennessee Valley Authority is finishing a new 20 year plan which includes less fossil fuel and more nuclear. This link takes you to the MarketWatch article; the plan isn't set in stone yet (vote early next year) but it sounds like they're serious. By now, many of you have read the letter that Constellation Energy has sent to Electricite de France, both of whom are partners in UniStar, which was set up to build a now stalled, new third reactor at the Calvert Cliffs site. That letter offers EDF the stake in UniStar that Constellation formerly had for one dollar, but requests payment of a fractional share of the development costs that Constellation has paid over the years. 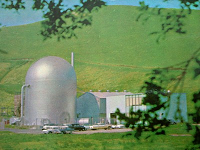 Overall, if EDF wants a foothold in the US nuclear market it should sign quickly. What I note today is the section of Constellation that indicates "serious reactor design deficiencies" or some such. The intended plant to be built was, we understand, to have been a French AREVA design (the 4500 MWt AREVA Evolutionary Power Reactor, or "EPR.") One has to wonder what those shortcomings are - and one wonders if such exist with designs already well along in the licensing process, such as the Westinghouse AP1000 that might get built twice at Southern Company's Vogtle site in Georgia. Again, we see evidence of how the largely fractured and segmented nuclear power industry in the US hurts us. Just in here is the news that Babcock & Wilcox, original reactor vendor for the cancelled Bellefonte 1 & 2 reactor plants in Alabama, has won a contract to build the steam generators for Unit 1. The company's B&W Canada subsidiary will perform the actual fabrication. See our previous posts on Bellefonte for more details. Breaking 5:45 PM EDT Weds - EDF to go it alone? Bloomberg is presently reporting that Electricite de France, or EDA, has responded to Constellation's having backed off plans to add a nuclear plant at Calvert Cliffs by saying it's willing to buy out Constellation and forge ahead. The plan includes the mention that after a process another partner or co-investor would be found. This is a bright note for nuclear here, and should be a wake up call that if US utilities and manufacturers and contractors and reactor vendors won't get it done, someone else will. Here is the Bloomberg article. Nuclear Engineering International is reporting that the Tennessee Valley Authority's long term plan includes an increased focus on nuclear power, and indicates that the federally-owned utility company may even shut down some fossil fuelled plants when emissions restrictions are made more stringent by the EPA. Most interesting is the assertion by NEI that it seems likely that TVA will push forward with Bellefonte, in Alabama (two unfinished units) and that work is already underway (as noted here) on Watts Bar 2. These, along with Vogtle, look like our best near-term bets for getting new reactors on the grid. 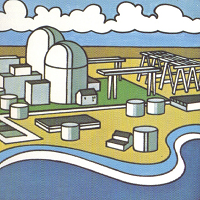 Watts Bar 2 is an unfinished Westinghouse PWR, rated 3411 MWt, 1177 MWe net, while Bellefonte 1 & 2 are unfinished Babcock & Wilcox PWR plants, which the company was referring to in print as their BW-205 model (with 205 fuel elements) and which were to have been rated 3620 MWt / 1213 MWe. As previously reported here and everywhere, Vogtle 3 & 4 are to be Westinghouse AP1000 plants. Look at this blog's LINKS section for the Westinghouse link; from there you can find an excellent downloadable Westinghouse brochure on the AP1000 plant, in PDF file format. We note briefly now that the groundwater sampling at Entergy's Pilgrim Nuclear Power Station (General Electric BWR plant) near Plymouth, Massachusetts has revealed a rise in tritium again, above limits. This has been an ongoing problem at this site, and serious investigation as to the source is underway. As before, this tritium has been found by the groundwater sampling program which is designed to catch this sort of thing BEFORE it gets into any publicly available water, or the general water table, so that Entergy is reporting that no one in the public is at any risk. Look here for a very brief and very new article. No surprise to anyone with any smidgen of knowledge of the industry is the arrival of an NRC inspection team at Robinson-2 yesterday. This article, derived from the NRC release, is a good brief description. As noted in our post in this blog on October 8, the combination of events at Robinson that resulted in two separate incident reports made to the NRC (one for the low-flow scram, another for the failure to isolate feed condition later on) was in sum somewhat alarming, and the NRC is on site. The inspection will run a week or so and the NRC will publish results on its site; we'll be watching. By following this link you'll see a very fascinating web page. As it happens, the Philippines began construction of a Westinghouse pressurized water reactor plant at Bataan in 1976, and after what appears to have been a vast debate nationally about funding and safety, completed the plant in 1984 although the debt for it was not paid off until 2007. No fuel was ever loaded. No steam was produced; not one watt of electricity was generated or delivered. The plant remains intact, complete, and finished. Those faults notwithstanding, this is a prime example of a wide array of unfinished plants all over the world, really, and what it REALLY is, is proof of the ability of a nation to waste vast amounts of money to build something they'll probably never use because fear caused them to pull back from what they thought was a brink but was actually a new horizon. 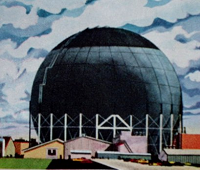 The public apparently augured disaster; we might look to the great confidence we found after the building and operating of S1W, Shippingport, Vallecitos, Dresden-1, Yankee Atomic Electric (Rowe) and a number of other early plants. We know now what both paths look like. Two recent announcements have put a little hitch in the nuclear renaissance. First, Constellation has halted further plans to add another nuclear generating plant to its Calvert Cliffs station; see articles here, and here. Adding to this, Progress Energy won't add a plant at Shearon Harris; see the announcement here. What this means is that as of this point, only the loan to Southern Co. for the purpose of adding a plant at Vogtle is active. While the price of natural gas seems to be having some effect on comparisons with nuclear, there's no question that there is both an economic basis to build nuclear plants and a public initiative to do so, not the least of which has been spearheaded by the President. In 2005, President George W. Bush spoke at Calvert Cliffs, the first presidential visit to a nuclear plant in 30 years. 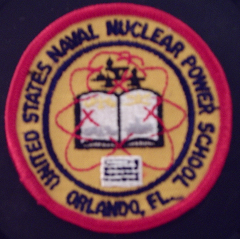 “It is time for this country to start building nuclear power plants again,” he said. Ah, so the first spark of this renaissance should be credited as having happened five years ago, it seems! Wald goes on to note that the last groundbreaking for a new nuclear plant which was actually completed occurred in 1973; I will add that present day historians should always remember that new plant orders stopped in 1978, a year before Three Mile Island. Economics struck the first blow last time the nuclear parade stopped; regulations and alterations as a result of the accident at TMI-2 struck the second blow. Let's hope that economics viewed short term aren't going to do it this time. We noted early today, and have now seen a Business Week report on, an incident at Robinson 2. It appears that for whatever unknown reason, one Main Coolant Pump tripped which led to a protective full scram on loop low flow. That pump now exhibits some leakage. During the event, a protective fire prevention water deluge system incorrectly actuated, and a hose ruptured during that sequence. Further, two Main Feed pumps tripped as well during the recovery. 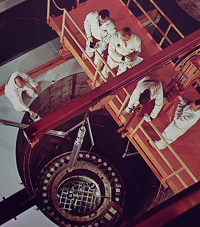 Adding to this chain is another separate event reported to the NRC concerning an apparent operational procedural error during subsequent plant recovery and stabilization operations that led to an inability to isolate feed to prevent rapid cooldown of the primary .. setting up the potential for thermal shock. While none of these things by themselves is all that alarming, the whole of the events coupled with some other recent problems at Robinson gives cause for attention, which it appears the NRC is giving. We'll report more if and when needed. On August 24th we noted here that TVA was moving toward finishing one or both B&W plants at the Bellefonte site; today we have reports that TVA has completed a contract with AREVA (that's a foreign concern, folks) to finish one of the plants. This article gives brief details. One wonders whether or not Babcock & Wilcox was consulted, or considered since that company was the original reactor vendor. It may indeed be the case that B&W is no longer in a position to act as vendor for such large plants.